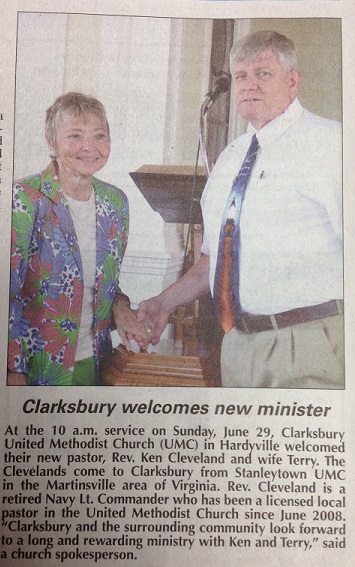 In July 2014, Clarksbury welcomed its newest pastor, Reverend Ken Cleveland, LCDR, USN (Ret). Pastor Ken received his license as a Local Pastor through the Virginia Conference of the United Methodist Church in June of 2008 and we're excited to have him and his wife Terry, join the Clarksbury family. Lieutenant Commander (Ret) Cleveland grew up in the picturesque Black Hills of Mount Rushmore fame in South Dakota and is a 1974 graduate of Lead–Deadwood High School. He entered the United States Navy in March of 1974 undergoing Recruit Training and OS “A” School in Great Lakes, Illinois. He deployed on Ships out of Norfolk, Virginia from 1975-1979 to the Mediterranean and Caribbean as well as the South Atlantic. He served ashore as an instructor and course supervisor at Dam Neck, Virginia from 1979-1982. He returned to sea aboard a destroyer out of Norfolk, Virginia in 1982 serving as Leading Chief Petty Officer and attaining the enlisted rank of Senior Chief (E-8) again deploying to the Mediterranean and Caribbean as well as circumnavigating South America and deploying to west Africa and the Persian Gulf, until his commissioning as a Limited Duty Officer (Ensign) in March 1987. Upon his commissioning, he reported to a cruiser, home-ported in Subic Bay, Republic of the Philippines, deploying to the Persian Gulf, Korea, Japan, the Southwest Pacific and Australia. He returned stateside in 1990 to serve as Instructor and Operations Department Head at Fleet Training Center in Mayport, FL until returning to sea again aboard another cruiser deployed to the Adriatic Sea in 1993. He further deploying to the Persian Gulf and Mediterranean and back to the Caribbean, eventually transferring to the Staff of A Carrier Strike Group in 1995, serving aboard the USS AMERICA (CV-66). In March 1998 he reported as Officer in Charge AEGIS Training & Readiness Center Detachment, Wallops Island, Virginia. He reported to duties as Air Defense Officer on the staff of COMMANDER CARRIER GROUP FOUR in July 2001 serving until his retirement in April 2004 with 30 years of service. His personal awards include the Meritorious Service Medal (2 awards), Navy and Marine Corps Commendation Medal (2 awards), Navy and Marine Corps Achievement Medal (5 awards), National Defense Medal (2 awards), the Military Outstanding Volunteer Service Medal and various other service and personal awards. 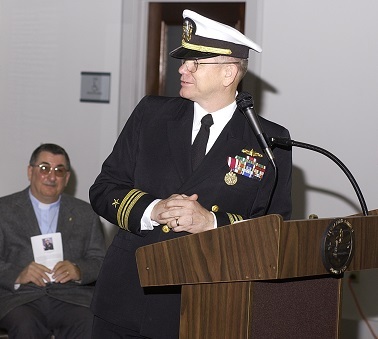 Reverend Ken Cleveland, LCDR, USN (Ret) received his license as a Local Pastor through the Virginia Conference of the United Methodist Church in June of 2008 and is currently serving as the Pastor of Clarksbury United Methodist Church. Lieutenant Commander, USN (Ret) Cleveland is married to the former Terry Parkinson of Norfolk, Virginia and has a daughter, Amanda Mae, who is married to Kevin Peters, and grandson Kalvin of Bethany, Oklahoma.